In this Indicator Spotlight, we’re looking at the Donchian Channel, originally developed by Richard Donchian. This is a trend-following indicator and was famously used by the Turtle Traders in their system. To learn more, watch the video or continue reading below. The story about the Turtle Traders originated from a discussion between famous commodities trader Richard Dennis and his long-time friend Bill Eckhardt on whether great traders are born or made. Eckhardt was convinced that certain a “trader type” character was the determining factor, whereas Dennis thought this was a skill that could be taught. In order to find out, they advertised for trading apprentices and trained a group of about 23 people with no trading experience. The group learned the rules of a simple trend following system over the course of 2 weeks. Upon demonstrating that they could follow the rules, participants were funded between $200K and $2 million, trading a range of commodities, currencies, and bond markets. When the experiment ended five years later, the Turtles had reportedly returned a profit of $175 million making it the most famous experiment in trading history. 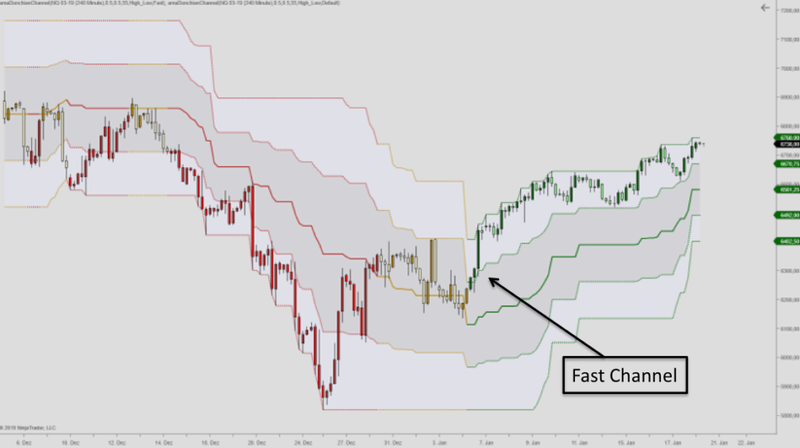 The Turtle Trader System entered when prices broke out of the Donchian Channel in two separate timeframes. System 1 looked for a breakout from the 20 day high/low, whereas System 2 used a 55 day high/low breakout. For System 1, a signal would be skipped if the previous trade was profitable, whereas all signals of System 2 would be followed. The Donchian Channel lines are calculated from the highest high and lowest lowover the lookback period (System 1 with a 20 days high/low channel above). Our Donchian Channel version also allows for calculating the channel lines by using the Open, Close, Median, Typical or Weightedprice. Breakouts to either one side of the channel lines are then identified, rendering the bullish, bearish and neutral trend states. A green plot indicates that the highest high of the lookback period has been broken whereas a red plot indicates a break of the lowest low. A neutral trend, as indicated by a yellow plot, occurs when the price retraces beyond the channel midline. Again, the main idea here is not to predict price movements, but simply to follow them. To that end our version also come with fast, slow and composite trend definitions. In the chart below we see the fast trend definition on a 4 hour Chart of the NQ for System 2 (55 bar high/low). 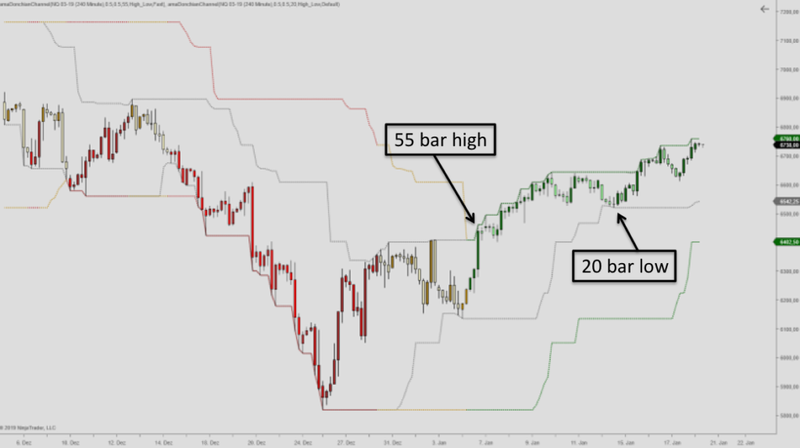 The fast filter allows the trend definition to trigger a few bars earlier than for the 55 bar breakout. The Turtles applied strict rules for position sizing and scaling into trades. No single trade would risk more than 2% of the available capital. Initially, only a fractional amount of the intended position size would be committed. If the position moved in their favor, it would be add to until the max position size was reached. For the chart example above, one could for example open a position on the fast channel breakout, further adding to it at the original System 2 breakout. The benefit of this approach is that on false breakouts, position will be relatively small because the full position size has not been committed. If the breakout is strong however, the maximum position size will be reached in order to fully capitalize on winning trades. The Turtle System Exits were said to be the most challenging part of the rules. In the chart below we see a gray 20 bar high/low channel added to the 55 bar high/low. 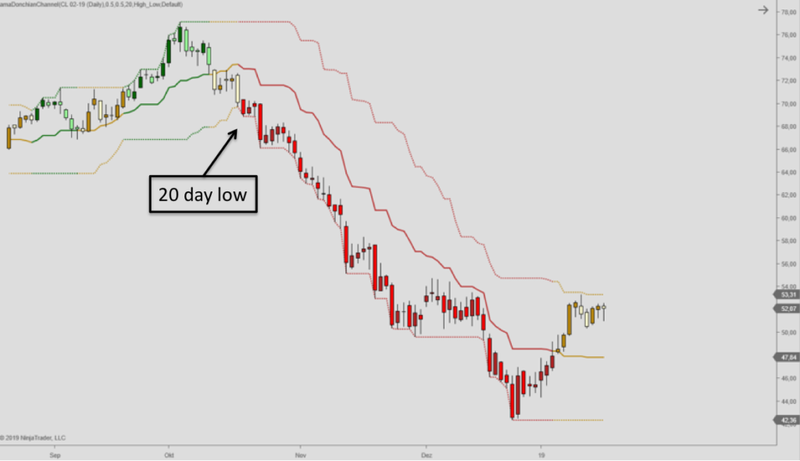 The 20 bar low would mark exits for long positions and a 20 bar high exits for short positions. The entire position would be closed if the price went against this level. For System 1, the exit condition would be a break of the 10 bar high/low. Waiting for these levels to hit, often meant giving back significant, if not all of the open profits. There was of course a strong tendency to take earlier exits. However, in order for the system to work, it was necessary to stay in the positions, waiting for the next windfall move. Following the experiment, the rules of the system were published and performance dropped significantly. Richard Dennis continued to manage capital but stopped doing so following heavy losses in the Black Monday stock market crash of 1987 and later in 1988. He later managed funds in the mid and late 1990s, closing these operations after losses in the summer of 2000. A number of Turtle Traders continued their careers as successful commodity trading managers, using similar, but not identical techniques, to the Turtle System. The original rules, taught by Richard Dennis may be found here.